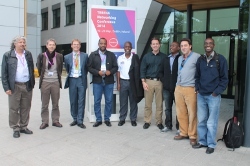 Big minds from every corner of world including Africa shared life-transforming ICT initiatives and cutting-edge technology at TNC 2014 in Dublin Ireland in May last year. Now Europe’s largest and most prestigious Networking Conference TNC is back. With more than 650 participants attending this annual event takes us to Porto in Portugal from 15-18 June 2015. TNC15, its 31st edition, will be hosted by FCT | FCCN, Portugal’s unit for the operation of the National Research and Education Network within the funding agency for science and research. TNC brings together decision makers, managers, networking and collaboration specialists, and identity and access management experts from all major networking and research organisations, universities in Europe and the globe over as well as industry representatives. Keynote speakers will be renowned specialists such as John Day ,Manfred Laubichler, Sarah Kenderdine, Timo Lüge, Avis Yates Rivers and João Paulo Cunha.